A pioneer in global health and a path-breaking theologian explore their common option for the poor in a new book drawn from their respective writings, using as a springboard public and private conversations hosted by the Kellogg Institute for International Studies at the University of Notre Dame. 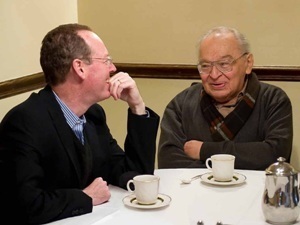 “In the Company of the Poor: Conversations with Dr. Paul Farmer and Fr. Gustavo Gutiérrez” (Orbis Press, 2013) will have its public launch at 7 p.m. Nov. 19 (Tuesday) in McKenna Hall Auditorium on the Notre Dame campus. When Paul Farmer came to campus in April to accept the Notre Dame Award for International Human Development and Solidarity on behalf of the global health organization he cofounded 25 years ago, he was profoundly moved by the opportunity to talk to a member of the Notre Dame community who has deeply inspired his mission to bring high-quality health care to the very poor. Rev. Gustavo Gutiérrez, O.P., the John Cardinal O’Hara Professor of Theology and a Kellogg Institute Faculty Fellow, is known around the world as the founder of liberation theology.